The santoor is an ancient folk instrument thought to have originated in Iran, (Persia) from where, according to the Iranians, it made its way to India. But ancient Indian texts also refer to a very similar instrument as a shatatantri (100-stringed) veena, at a time when the word veena did not refer to a specific instrument but was a generic terms for all string instruments and was classified as a zither rather than a lute. Perhaps more than any other Indian classical instrument, different versions closely resembling the santoor are found in a number of musical traditions around the world and are known by a variety of names including the Yang Quin of China, the Cimbale of Central Asia and the Santoori of Greece to name but a few. Some sources believe that when the gypsies from India travelled all over Europe they carried with them the original Indian santoor which was subsequently modified in various countries and tailored to local musical needs. In Hungry for instance, gypsy music is played on the Cymbalan, another instrument closely resembling the santoor. According to the world’s top santoor maestro, Shiv Kumar Sharma, the santoor may have also inspired the invention of the piano as the two instruments are based on the same system of producing sound. (When piano keys are struck, they result in strings inside the piano being struck by small hammers). The santoor became a vital part of the folk music of the Kashmir region where it is the favourite melodic accompaniment for Sufi (Islamic mystic) vocal music in a style known as Sufiana Mausiqi and it is possible that it was introduced into the area either by early Persian Sufis or traders. A hammered dulcimer shaped like a trapezium and usually made out of maple or walnut wood, its strings are played by being struck with two lightweight wooden mallets held between the index and middle fingers. The top and bottom boards can be made of either plywood or veneer. Wooden bridges are placed on the top board, (also known as sound board), to accommodate metal strings which are stretched across. The strings, grouped in units of three or four, are secured by being tied to nails or pins on the left side of the instrument from where they are stretched over the sound board on top of the bridges to reach over to the right side. This side also houses metal tuning pegs or tuning “pins”, as they are commonly known, and using these pins each unit of strings can be tuned to a desired frequency or pitch. 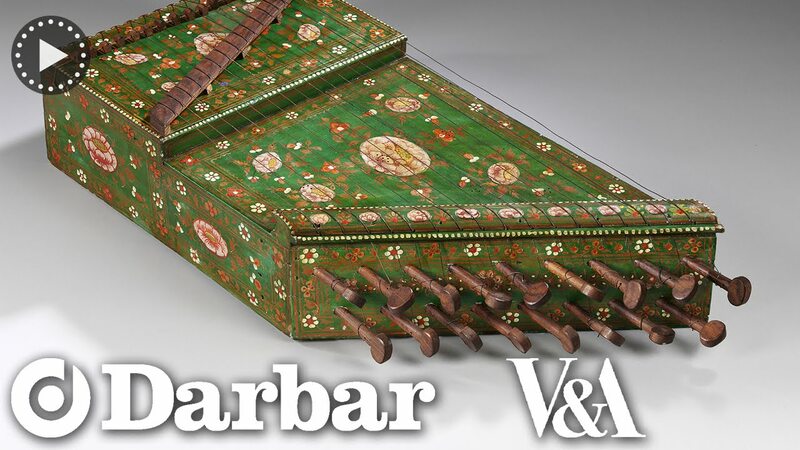 The Persian santoor has fewer strings (around seventy-two) compared to its Indian counterpart which usually has 90 or more and is more rectangular than the Persian santoor. Each pair of strings passes over two bridges, one on each side of the instrument. 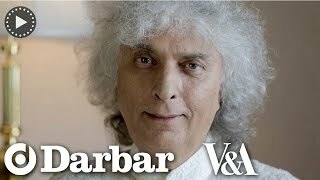 The santoor we hear in Indian classical music today – notably that of the maestro Shiv Kumar Sharma and his son Rahul Sharma – has 31 bridges and over 90 strings, with a range of three octaves. In Indian classical music, the santoor is played while sitting in a yoga-derived position called ardha-padmasana, (or half-lotus) in which one foot is placed on the thigh and the instrument is then balanced on top of the lap, (unlike Persian and Kashmiri folk music where the instrument is placed on a wooden block in front of the musician.) While playing, the broad side is closer to the waist of the musician and the shorter side is away from the musician. It is played with a pair of light wooden mallets or hammers with both hands. It is an extremely delicate instrument and is very sensitive to light strokes and glides. The strokes are always played on the strings either closest to the bridges or just a little way away with each style resulting in different tones. Sometimes strokes by one hand can be muffled by the other hand by using the face of the palm to create variety. Painted and varnished wood, metal wires and rosewood pegs, Kashmir, India, 1850-80. Purchased from the Carl Engel Collection in 1882. A similar instrument is shown in Charles Russell Day, The Music and Musical Instruments of Southern India and the Deccan (London and New York: Novello, Ewer and Co; London: Adam and Charles Black, 1891), plate VIII, pp. 133-134. Although it is now an important part of North Indian classical music, it has taken the best part of half a century for the santoor to gain full acceptance as a solo instrument for Indian classical music. This is mainly because the strings of the santoor are struck with mallets rather than plucked, the overall sound tends to be percussive as opposed to the more fluid tones of other Indian string instruments where notes can be held and slides between notes performed with astounding rapidity. But the santoor’s top Indian classical maestro, Shiv Kumar Sharma’s persistence has paid off and even diehard purists have been forced to admit that this instrument is as worthy of faithfully executing a classical raag recital as any other Indian string instrument. The santoor’s entry into Indian classical music as a solo instrument and its subsequent popularity in this genre is almost completely due to one man who remains its most outstanding maestro: Shiv Kumar Sharma, (born 1938). Earlier in the 20th Century, outside of the Kashmir valley, most Indians had not heard the santoor until the early 1950s when Uma Dutt Sharma, (father of Shiv Kumar Sharma,) a trained vocalist and also an able musician of numerous other instruments, became enamoured of the sounds santoor which he had heard in Jammu and Kashmir and attempted to introduce the instrument to Indian classical music. It is said that it was the senior Sharma’s dream that his son should be the first Indian classical musician to take up the santoor and make it a fully-fledged classical instrument. The dream certainly came true but not before a long and hard struggle on the part of the senior Sharma as well as his maestro-to-be son, Shiv Kumar. It was not an easy task because the santoor is struck with mallets rather than plucked, with the result that the overall sound tends to be percussive as opposed to the more fluid tones of other Indian string instruments where notes can be held and slides between notes performed with astounding rapidity. For this reason, it has taken the best part of half a century to convince diehard purists that if handled correctly, the instrument is as worthy of faithfully executing a classical raag recital as any other Indian string instrument. In the early years, although fully classically trained, (including education in vocals and tabla,) Shiv Kumar Sharma started playing santoor as a session-musician for Indian film music which is more amenable to providing a home for a variety of instruments. (In later years, he was to go on to form the film composer-duo, “Shiv-Hari”, with the bansuri (bamboo flute) classical maestro Hari Prasad Chaurasia.) But in those early years of his film career, his solo santoor pieces for a famous classical music and dance-based film of the late 1950s, (Jhanak Jhanak Payal Baje) were immediately noted by critics and went a long way towards convincing diehard purists that handled correctly, the santoor might, after all, deserve admission to the line-up of Indian classical music instruments. Even so, there were many who still had serious doubts as to whether an entire raag recital could be sustained on santoor alone, particularly the alap, (slow, pulse-free introduction) which requires a deeper more tentative and meditative timbre as the notes of the chosen raag are explored singly and only gradually combined into slow-tempo phrases with rhythm having little or no part in this section of the performance. With Shiv Kumar Sharma continuing his father’s work, and making many further modifications to the instrument resulting in an improved tonal quality as well as an altered playing technique – the santoor is now balanced on the lap instead of being placed on a wooden block in front of the musician as was the case for Kashmiri folk music – the much-revered santoor now holds an important place in Indian classical music. And it appears that the santoor is now set to stay as Shiv Kumar Sharma’s son, Rahul Sharma, (born 1972) – whether as a solo artiste or in a duet with his father – continues to delight audiences around the world, while one of Sharma’s best-known pupils, Satish Vyas, has also made his mark on the instrument.